Something of a visual cliché? For all the talk of Comme des Garçons as a pioneer of the unfamiliar, their patchwork shirt is a oft repeated signature. Season after season, in the SHIRT line, at Junya Watanabe, at Homme Deux and, as we see here, at Comme Homme. Thing is, everyone else is at it too. Brands from Needles to Lanvin, VISVIM to Gant; the grafting of complimentary (or contradictory) fabrics and pattens into one shirt has become something of a visual cliché. 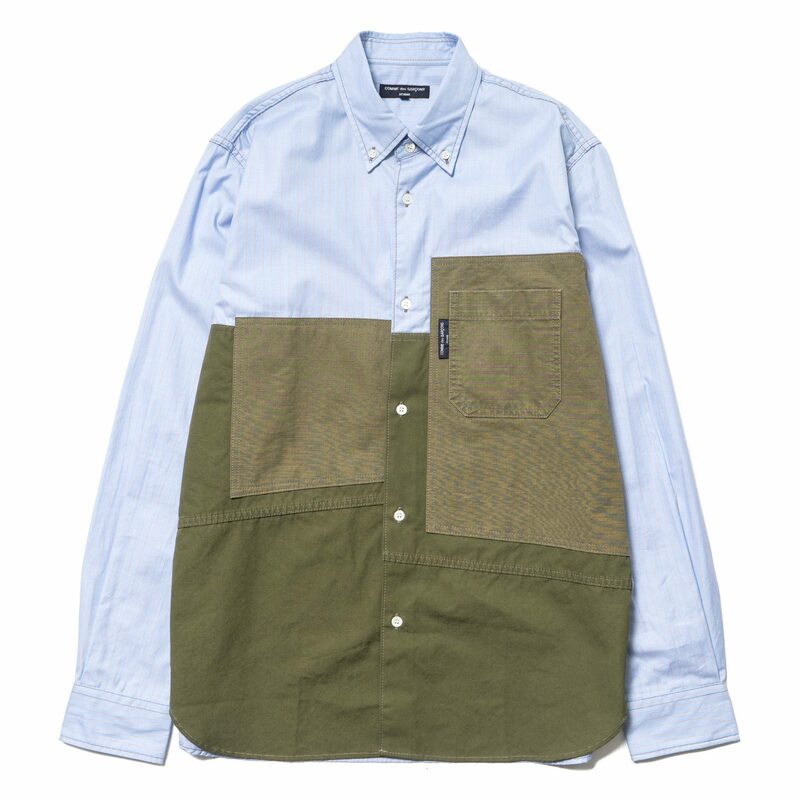 Even so, with right approach, patchwork shirting can still look extraordinary and Junya Watanabe’s lighter touch at Comme Homme provides exactly that. 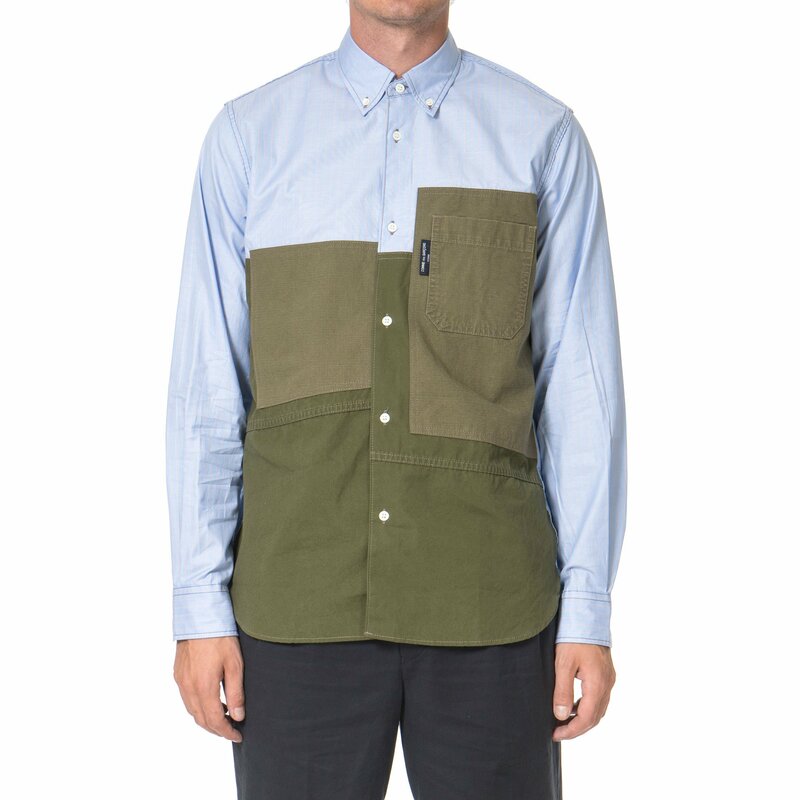 Oxford cotton up top with cotton twill and ripstop used below, the clash of fabric density is reflected in the colour choices, running from sky blue to deep olive. As an object, I’m totally about this. But in practical terms, I do find the Homme line and Homme Deux for that matter, a little slim cut. To my mind a shirt like this deserves to be fuller, more relaxed, as befitting its (presumed) function. Comme Homme seems a little schizophrenic to me – casual feels, but trimmed for the office. That might be why, for all their seasonal ubiquity, you rarely spot anyone actually wearing Comme patchwork shirts. Of course, it’s conceivable the £436 price tag may also have some relevance.